- Ask your designer if the have vases or containers they rent out. - Try meeting with a few small/home based designers rather than flower shops downtown (they tend to be more expensive. -Visit the dollar store or craft store and search for sales on vases or containers. 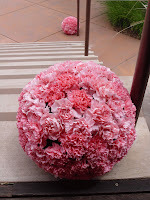 - Use large full flowers to create arrangements. - Use the chair flowers from the ceremony on the buffet table, cocktail tables, cake table, bathrooms, and head table and so on. - Bring the ceremony arrangements into the reception area. - Rather than corsages or a hair wreath try doing hair flowers. - I encourage you to have guests take flowers home with them (not the rented vases) or please donate the flowers to local rest homes. I always donate to local rest homes and it brings big smiles to people faces. - Don’t put flowers where they will not be seen or noticed, why spend the money on something people will not see. - If you are getting married in the summer think about flowers that will hold up in the heat, the last thing you want is wilting drooping flowers. - Silk or fake flowers tend to be more expensive than fresh flowers. - Not everything you see in magazines or online are practical, by this I mean a bouquet of poppies will last minutes before the flowers begin to wilt. I hope this bit of advice helps you when planning your big day and good luck! If you have any questions or comments please feel free to contact me, I would love to hear from you.